Cildo Meireles, Inserções em circuitos ideológicos 2: Projeto cédula (Insertions into Ideological Circuits 2: Banknote Project) (detail), 1970, ink on banknotes, dimensions variable. IN BRAZIL, PUBLIC SPACE IS HARD TO FIND The nation’s lingering colonial past, in combination with its patrimonial social and political system, has prevented the development of a solid and identifiable public sphere. Private-property ownership remains the prevailing model, with few genuinely collective spaces integrated into Brazilian urban design, while the persistence of a business-as-usual politics of power and influence has tended, at least until recently, to suppress genuine public discourse and discourage grassroots activism. Not surprisingly, then, Brazil also lacks a cohesive tradition of public art. And for this very reason, the most important work of public art ever produced in Brazil is not a sculpture in an urban space but what the artist called a kind of “mobile graffiti” applied to objects borrowed from the universe of consumerism: Cildo Meireles’s Inserções em circuitos ideológicos (Insertions into Ideological Circuits), 1970, which consists of subversive messages inscribed on circulating banknotes and mass-produced goods, such as glass Coca-Cola bottles (the latter were modified by the artist before being redeemed for their deposit, refilled, and redistributed). Like readymades in reverse, these pieces were anonymously discovered by members of the public over the course of their daily lives rather than encountered within the specialized domain of art. Meireles’s practice suggests that in a country with such a weak tradition of public engagement, a work of art achieves something like a true public dimension not through the insistent physicality of monuments in parks and city squares but through ephemeral effectscritical interventions that might short-circuit economic and governmental systems and thereby forge new, different, and more powerful modes of urban experience and social interaction. But where does such ideological critique stand today, as Brazil’s cities are undergoing profound physical transformationand none more so than Rio de Janeiro, which is gearing up for the World Cup this summer and for the Olympics in 2016? Rio lost much of its postwar economic dynamism in 1960, when it ceased to be the country’s capital, and has been plagued by sprawling slums and increasing violence ever since. In preparation for hosting these mega-events, the city has recently undertaken a series of major infrastructure and urban-development projects aimed at regaining economic momentum and improving its beleaguered reputation. The city will need to significantly reduce violence for these projects to succeedsome are in fact being built on sites of cleared slums and have been brandished by developers and politicians as proof of the success of the favela-pacification plan undertaken by the state government. Under this initiative, so-called Unidades de Polícia Pacificadora or UPPs (Police Pacification Units) enable local communities to reclaim areas previously controlled by drug traffickers and organized crime. If Rio has long been characterized by endemic violenceas famously depicted in Paulo Lins’s 1997 novel Cidade de Deus (City of God) and the graphic images of urban decay and gang warfare in the 2002 film adaptationthe new plan is helping the city slowly overcome such associations. But as welcome as a steady decrease in crime may be, reclaiming and redeveloping urban territory is not necessarily the same thing as establishing an active public sphere. Indeed, however such projects may be labeled, their execution reveals them to be far from public. All too often, their speed of construction and monumental scale are a distraction from their lack of transparency. They have not been commissioned through open competition: Little information about them has been made available, and, partly as a consequence, there has been no surrounding public dialogue. This is the case with the so-called Porto Maravilha and the Teleférico, two pillars of Rio’s urban makeover. The first is a sweeping transformation of the city’s port area, where industrial buildings have given way to cultural and business centers in an attempt to reestablish the connection between the city center, tourism, and the city’s distinctive shoreline. The second is a major infrastructural addition to the Complexo do Alemão, a group of favelas on the north side of the city where a sustained war broke out between police and drug traffickers in 2010. Because the favelas are cut off from public transportation networks, with no train and little bus service, those who live there are profoundly isolated even though they are not geographically distant from much more affluent neighborhoods. This sad irony, common to so many cities, is particularly apparent in Rio, thanks to the city’s mountainous topography. While slums are often pushed to the periphery, Rio’s favelas are distributed throughout the city, dotted along the many hills that are too steep to be desirable for other development. Inspired by the successful example of a similar project in Medellín, Colombia, a massive gondola lift was built to connect the Complexo do Alemão to one of Rio’s main train linesa strange, if also ruthlessly efficient and highly cost-effective, attempt to solve the neighborhood’s transportation problems. For neighborhood residents working elsewhere in the city, what was previously an arduous and dangerous commute on foot is now a gondola ride of some twenty minutes. 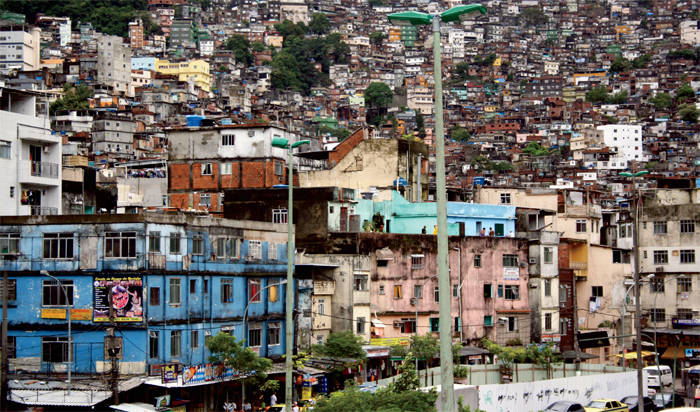 Today, the peaceful Complexo do Alemão has become one of the city’s new postcard images. Favela da Rocinha, Rio de Janeiro, January 22, 2009. Photo: Scott Hadfield/Flickr. Yet the picture of a calm and quiet city united around the urban and social benefits of these public works is but a will-o’-the-wisp. Despite being held up as a symbol of the regeneration of Brazilian cities, Rio could well be a time bomb set to explode during the World Cup or Olympics. The Brazilian public itself clearly remains unconvinced by this semblance of transformation, perhaps even finding its voice in opposition to the city’s urban-marketing campaign. In June 2013, for instance, residents of Favela da Rocinha, the city’s largest slum, opposed the construction of a gondola lift similar to the one in Alemão. “Sanitation yes, gondola no” was the slogan of the movement. The protesters voiced a lucid awareness of the fact that such iconic infrastructural projects do more than simply offer a link to surrounding neighborhoods; they also grant the city a tangible boost to its image, while basic services such as trash removal remain almost nonexistent, even though they have a far greater effect on living conditions. Indeed, by literally lifting favela inhabitants out of their neighborhoods without addressing underlying social issues, the gondola projects imply thatat least in the government’s viewthese residents do not have the same right to the city enjoyed by those who live in less blighted areas. The Rocinha movement echoed the massive, citywide protests that erupted that same month in response to the escalating cost of public transportation and soon expanded to embrace other social demands, including more government transparency and reduced corruption. At the same time, favela residents expressed growing displeasure with the de facto occupation of their neighborhoods by government forces. In July 2013, a mason’s assistant named Amarildo Dias de Souza disappeared during a sweep by a UPP. All available evidence seems to indicate that he was killed by the police, which has largely discredited the UPPs and sparked further unrest. 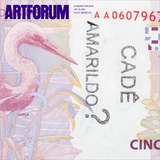 In response, Meireles updated his forty-four-year-old project and began passing out banknotes stamped with the questions WHERE IS AMARILDO? and WHAT HAPPENED TO AMARILDO? If Meireles’s original workproduced during the most repressive years of Brazil’s military dictatorshipperhaps inevitably met with limited public response, his latest intervention may find a broader resonance within the genuine public sphere that seems to be emerging in the face of the current government’s attempts to co-opt the future of Brazil’s cities. Meanwhile, Mayor Eduardo Paes has used a metal beam from the Perimetrala highway overpass demolished during the construction of Porto Maravilhato make a minimalist sculpture for the garden of his home. This surreal conversion of infrastructure into sculpture reminds us that Brazil’s patrimonial powers will always prefer architecture as sanitized image and art as inert monument, rendering acts like Meireles’s more urgent than ever. Guilherme Wisnik is a professor of architecture and urbanism at Universidade de São Paulo. Translated from Portuguese by Wendy Gosselin.